I have always been tempted to compare this book with Darrell Craig's "Iai, the art of drawing the sword" although I'm not sure why exactly, maybe because they both have a yellow cover. The french book is more compact (113 pages) and includes less stories and anecdotes. It consists of two parts: 1 Spirit and 2 Technique. The first part (37 pages) consists mostly of a rather good historical overview of seitei iai, Muso Shinden ryu, Mugai ryu, Tenshin Shoden Katori Shinto ryu and Takenouchi ryu. There is an interesting section "Iaido or Iaijitsu" discussing Toyama gakko and Nakamura: quite a lot of information in less than 40 pages. The second section deals with seitei iai, posture and basic movements, reishiki (no sageo handling, and slightly different from current form; the left hand pulls the saya into the obi, among other things) and all 10 kata. The authors freely admit they don't give the definite version of this continually changing series (though at the time apparently they believed there would one day be a definite version). The drawings in this book are clear and the descriptions stress important points. Many details are not mentioned, but then again, this means almost all points are still valid. This is actually the best beginners guide book I know of (which was precisely the point of the book; "discover iaido"). There are several appendices; including the alleged scene from Sanjuro depicted in "This is Kendo" (which isn't in Sanjuro at all), the TSKSR kata included below, and a description of iaido equipment. One really poor layout choice was to place the sword drawing with numbered parts and the part names on the reverse side of the same page. Also missing are instructions on wearing the uniform. The book include a few pages with photographs, including the famous Tsumaki Seirin shot by Raick, J.P. Raick himself doing Tamiya ryu, Kuroda Ichitaro doing Omori ryu, historic photographs of a very young Hiroo Mochizuki doing iai, pictures of what I think is Nakamura in Toyama uniform doing tameshigiri, and of course some pictures of the authors practicing Muso Shinden. 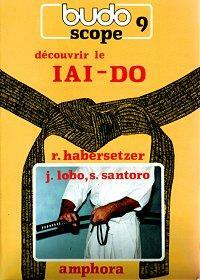 Jose Lobo was 2nd dan Iaido and 2nd dan Karatedo, Serge Santoro 2nd dan Iaido and 1st dan Jodo at the time they wrote the book. R. Habersetzer is the editor of the Budoscope series, which includes volumes on karate, judo, aikido, jujutsu, kung-fu, tae kwon do, tai chi chuan, and kendo. The unnamed "juponme" then probably is Yukia migi chidori no tachi, although I don't see much migi chidori about it, I wouldn't be too surprised if it were another one, maybe Nuki uchi no tachi. By popular request, I add the list of TSKSR kata I used. Please note that I didn't compile this list and I don't know how accurate it is.